It focuses on a graphics settings menu—but we're not sure it's the real deal. Footage of what looks like a PC build of Red Dead Redemption 2 appeared on YouTube recently. If it is a fake rather than a genuine leak, it’s a pretty good one, though it also raises a couple of doubts. The video was taken down by the user, but it’s been preserved and reuploaded. Take a look below. It’s a very brief look, only 25 seconds long, and it’s out of focus, but we still get a decent look at the important stuff: the PC settings. Below the sharpness, brightness, colourblind mode and kill shots, we get what might be our first look at Red Dead Redemption 2’s graphics options. The user changes the resolution in the video, which makes it a lot more convincing, and despite being incredibly blurry, it’s still possible to make out lots of things we can tweak. It’s standard PC stuff: screen type, resolution, refresh rate, FXAA, VSync and then a bunch of quality settings. A couple of things do leap out at me and make me question the authenticity of the video, however. First of all, we don’t see anything beyond the menus, which would arguably be the easiest thing to fake, and we don’t really see enough of the graphics settings to compare it with Rockstar’s last PC port, GTA 5. One thing that’s notably missing is post-processing options. It looks like you can turn FXAA on, but there’s no sign of other anti-aliasing techniques, or things like ambient occlusion or anisotropic filtering. The missing options could be below, of course, though they often sit together, as they did in GTA 5. If this is real footage, it’s also unlikely finished. 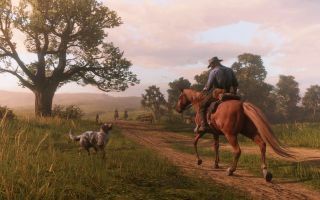 No PC version has been announced or even alluded to by Rockstar, so it’s unlikely that a build is ready to go. There’s no reason why a dev build would need a counter that shows how much VRAM you’re using, for instance, which might explain why it’s nowhere to be seen. There are a few reasons to believe a PC version is coming, whether this video is real or not. We’ve collected all of them to figure out what the chances are of Red Dead Redemption 2 coming to PC. We've also reached out to Rockstar to ask whether this footage is a fake.